When everyone’s sweating and pent-up energy needs to be expended somewhere other than the four walls of your home (why is it that your house seems smaller than usual when kids get overactive indoors?! ), head out to any one of these fabulous playgrounds with added water features and keep everyone occupied and cool. Don’t forget your towel, thongs, sunscreen and hats! 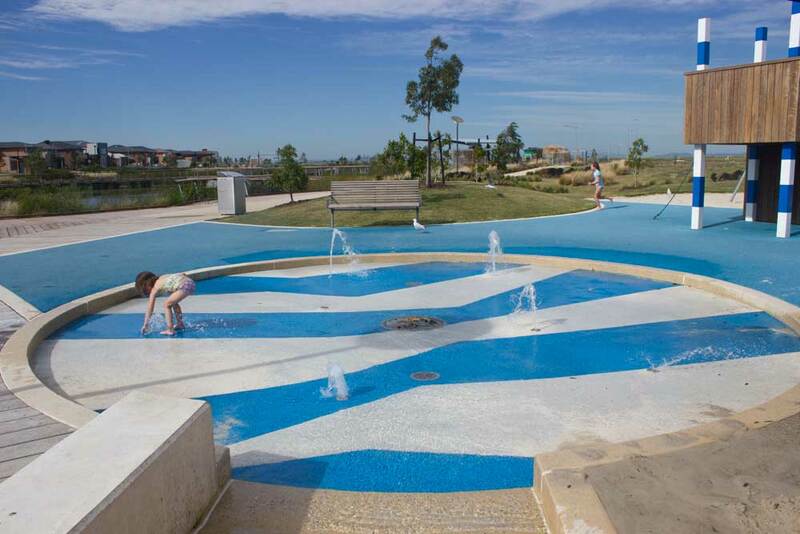 The king of free water play parks in Melbourne would have to be the River Walk Park and playground – a brand new space not only filled with a skate park, basketball court, green grass to run around on, shaded picnic seats (with bar!) and BBQs galore, but a full playground and equal-sized water play splash park. Run under misty tunnels, shoot your mate with a hefty water cannon, prance through jets, spouts, taps, pumps and dumping buckets galore. The water does shut off after 30 minutes and a 300 jet water cycle, but there are two areas to push a button and activate the sequence again. There isn’t any shade and it can get pretty windy so keep that in mind. The newest, biggest, most thrill-iest and best water park in the state! After a massive mutil-million dollar reno, Gumbuya World in Tynong North became an awesome wildlife zoo, thrill-seekers theme park and a water wonderland all in one. In terms of water fun, the kids will love the epic water slides, drifting along the 300 metre Lazy River, or getting deliriously drenched on Typhoon Island. There's also heated rock pools, a wave pool and what all water parks should have - waterside cabanas! We absolutely love this place. And at just 50 minutes from the CBD it makes for a great day out with the family! An absolutely gorgeous updated park in Kirkdale Reserve that’s been built to merge with the Merri Creek environment. The nature-play space sits among picnic tables and barbecues and features climbing hills, slides, cubby houses complete with birdwatching information and binoculars, timber teepee, carousel, and swings. In an effort to get kids to interact with the natural environment, they’ve included a hand pump that allows water to run down a small inclined creek bed (bring your diggers and your bucket and spade) that leads to a sand-digging patch. 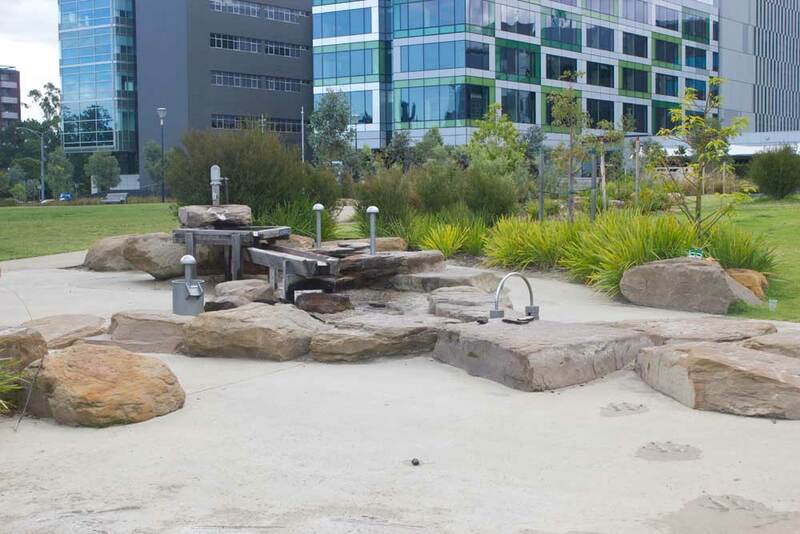 The Nature Play area alongside the Royal Children’s Hospital has been named Melbourne’s Best playground, and if you ask my kids, they’d agree! Not only is there a plethora of things on which to run, jump, climb, and swing, but there is also a space to splash and get wet – every kid’s dream. It isn’t particularly shady, so keep that in mind on those Melbourne scorchers, but the water play area is top notch. Jets, pumps and catchment areas mean there’s plenty of room for everyone and plenty of things to do to keep cool. One of the newer establishments, the Crocodile Park inside the new Saltwater Coast estate in Point Cook is an absolute ton of fun. When you get hot and sweaty climbing ropes, running up hills, walking the plank, and tearing down slides, there’s a huge wet play area beginning at the ubiquitous water jets and ending at a giant crocodile sculpture shooting water into a sizeable paddling pool. In between these two end points are two man-made creeks that the water flows through, and everything is surrounded by soft, white sand, and soft green grassy hills. To the left of the splashy fun bit are real wetlands and boardwalks, where nature abounds. The sun and wind does too as there’s not much shade and no real wind breaks to speak of, so keep that in mind! I dare say that will change as time goes on and the estate is more established. There was enough to keep the kids entertained even after the water play was shut off (it seemed to turn off at 5pm, though double-check that before you go if you are headed there in the afternoons), as there were plenty of small and medium puddles in the sand next to the paddling pool, not to mention the regular play equipment. A real favourite among locals, the Children’s Garden can be a veritable pram parking lot some days! The water play inside the fabulous gardens full of things to climb and explore include the popular water jets nearest the front entry gate, and a running water creek a bit further on, that wraps around one of the shady lawn spaces. 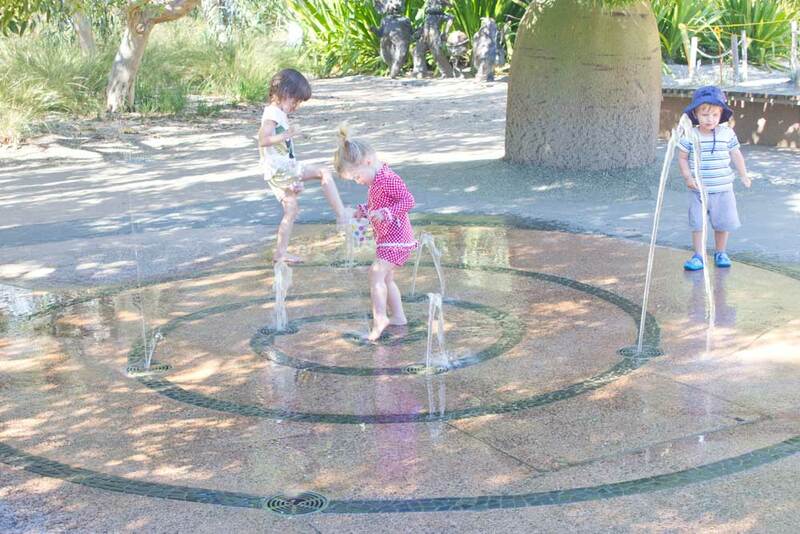 On searingly hot days, the Botanic Gardens and the Children’s Garden in general are beautifully cool spaces to spend some time, and the water play areas are a welcome bonus. 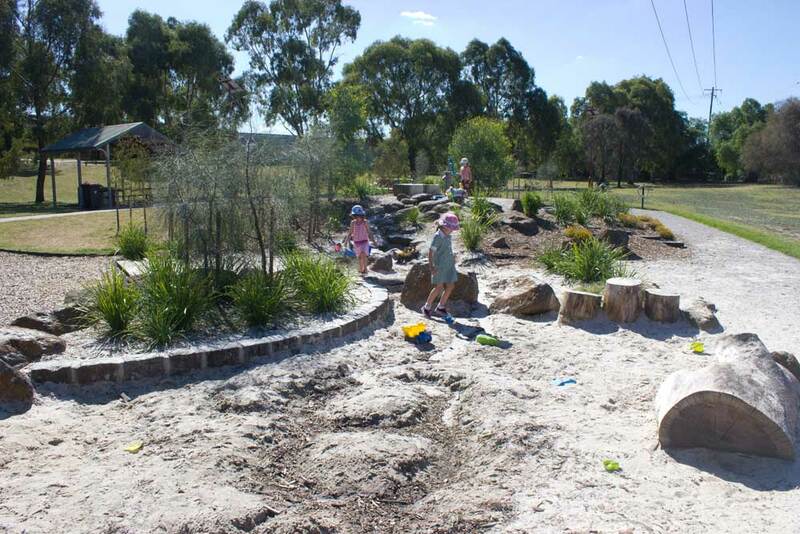 The Community Bank Adventure Playground has been built for “all ages, all abilities, all seasons”, which is welcome when Melbourne turns on its confusing weather charms. After giving it your all in the five-story tower fort (complete with not one but three slides! 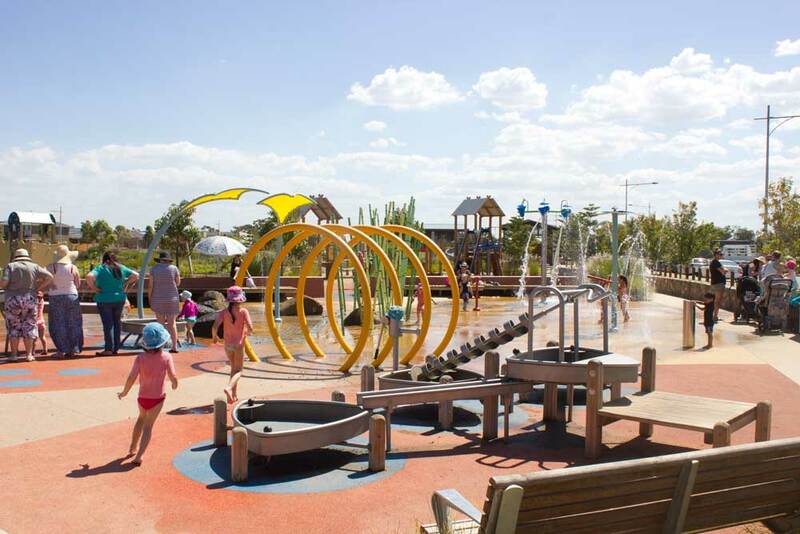 ), the 25-metre flying fox, carousel, nest swing, sand play, and cool interactive tractor, head over to the always-free water splash area full of jets, pumps, troughs along the water channel, aqua drop bucket (look out! ), and run through the squirty-water tunnel before catching your breath in the creek bed seats. A bit more than your usual sprinkler on the lawn for when you want to make a real day of it.